If your family member does not improve, they must leave or start paying out of pocket. There is no assistance for long-term care unless they have long-term care insurance, either through their employer (which is increasingly rare) or having purchased it outright, which is extraordinarily expensive, particularly the older you get. In 2017, the average nursing home cost about $6,844 per month for a semi-private room, according to Genworth Financial. (2) Naturally, it can be an emotional time when a parent must enter one. Not only because nobody ever wants to go into a nursing home, but also because the financial blow can be devastating. Life savings can evaporate quickly. And there is no help from the government for long-term care until a person goes completely broke and qualifies for Medicaid. Thus, many people consider moving their family member into an assisted living or memory care community. Many of these facilities are private pay, which means they do not accept Medicare or Medicaid. So, what are the differences between assisted living, memory care, private pay and a nursing home? Assisted living and memory care communities adhere to a social model. An assisted living community’s average monthly price is $3,628, according to Genworth. Assisted living communities are not nursing homes. There is no doctor making rounds and, in many instances, there is not even a registered nurse or LPN on site around the clock. Usually, certified nursing assistants provide care. They help residents bathe, dress, use the toilet, and provide some supervision to protect against falls and other accidents. However, they do not have the resources to keep a constant eye on them. Many seniors find assisted living a way to continue to socialize. In addition, they can maintain some independence when they become too impaired to care for themselves. Good assisted living communities will keep seniors busy with a range of activities and social events, from reading daily news headlines to live entertainment, movies, birthday parties and more. Many older adults make new friends in assisted living and find life much more enjoyable than being home alone or feeling like “a burden” to family. But beware. Many places will “step up” prices, based on certain conditions. For example, insulin shots can result in price increases of several hundred dollars per month. At an assisted living or memory care community, you must provide all toiletries, too. It’s important to understand that memory care is a social model, too – it’s assisted living, but provides additional services. Memory care also costs more – about $5,000 per month, on average, per Genworth. Most memory care homes are on lockdown so a resident cannot wander outside. The staff should be specially trained for caring for people with dementia. Such patients can at times display difficult behaviors including anger, inappropriate language, or offensive slurs. Good memory care communities should have a geriatric psychologist on staff and an activities director who has experience in nurturing people with dementia. Caregivers should approach people with dementia from the standpoint of what they still can do instead of what they cannot do. People with dementia do better in small environments where they receive more attention, so beware of multi-level memory care facilities with 30 residents or more unless your family member is high functioning. Even nursing homes, which provide a much higher level of care, usually have a separate dementia wing which employs nurses and CNAs with special training. For older people who have a healthy pension or nest egg, private-pay facilities seem attractive. Many resemble resorts, and at far less than the cost of a nursing home. The traditional homes may appear drab or institutional in comparison. But remember, safety should be paramount. Is your parent is a fall risk? Have they lost executive function (the ability to turn a thought into an action)? If so, memory care and assisted living communities probably cannot provide the level of care they need. Understand that assisted living and memory care communities can and will evict residents who become too much to handle, especially when a waiting list develops. With 11,000 Baby Boomers per day turning 65, that happens a lot. Many states have laws requiring residents with certain needs to live in nursing homes instead of assisted living or memory care communities. This can result in a forced move as a resident’s health deteriorates. This is for the safety of the elderly person. Also, know that private-pay facilities don’t answer to the same federal standards of care as places that accept Medicare or Medicaid. That can mean, for example, that nursing assistants in private-pay assisted living or memory care communities don’t need to be certified. State laws overseeing long-term care facilities vary widely state to state. If you choose to put your family member in a private-pay facility, be sure to ask lots of questions about staffing levels, certification of employees, and most of all, turnover. High turnover can denote a poor work environment, which is the last place you want your mom or dad to be. Finally, plan a surprise visit on a weekend before you move them anywhere. The low cost and home-like environment is the upside to assisted living and memory care. Indeed, some are quite beautiful. For a parent who is still relatively high functioning, assisted living or memory care communities are a good option. But for those who are accident prone, a nursing home – with a room near the nurse’s station – is more appropriate. While it can be difficult to discuss, a parent who finds themselves losing their independence — or who acknowledges it could happen — should tour long-term care facilities before they need to enter one. That way, they can decide for themselves if they would feel comfortable somewhere. That said, facilities frequently change hands, and so does the standard of care. 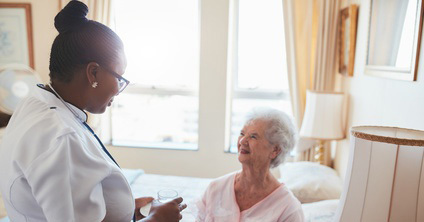 A prepared caregiver would want to do a facility “checkup.” Consider doing this if years or even several months have passed between a parent selecting a place and actually needing to enter one. Planning to move a family member into your own home instead? Read more about creating a safe and comfortable living space.